We recently wrapped our 4th Online Sales and Marketing Summit. I have attended three of the four summits, each from a different viewpoint: as a seasoned OSC, a new coach, and lastly an experienced coach. I realized that although my perspective changed each year, many things remained the same. First of all, prospecting is hard and very few are doing it successfully. Second, the online sales role is still operating in a silo at times disconnected from onsite sales. Lastly, this job is challenging and burning or rusting out is still a real problem. Prospecting is Hard– True Story: Barb Dibrito, in online sales for Keystone Homes, actually came up to me and said she was excited to hear the presentation on prospecting. Other than Barb, I honestly can’t think of anyone who starts their day excited about making dozens of “cold” outbound calls. If you have a ton of new leads coming at you on a daily basis, it’s hard to find the time to focus on prospecting. Set aside the time. At least two hours each day. Segment leads by type and date. Create lists of older leads that are outside of your short-term follow-up process. Create and send a simple message in mass– NOT email marketing. Follow up with phone calls. Set realistic goals for each day and make it fun. If I make x amount of calls and set x amount of appointments, I’ll get that new pair of shoes! Tackle the prospecting elephant by accomplishing bite-sized portions each day. 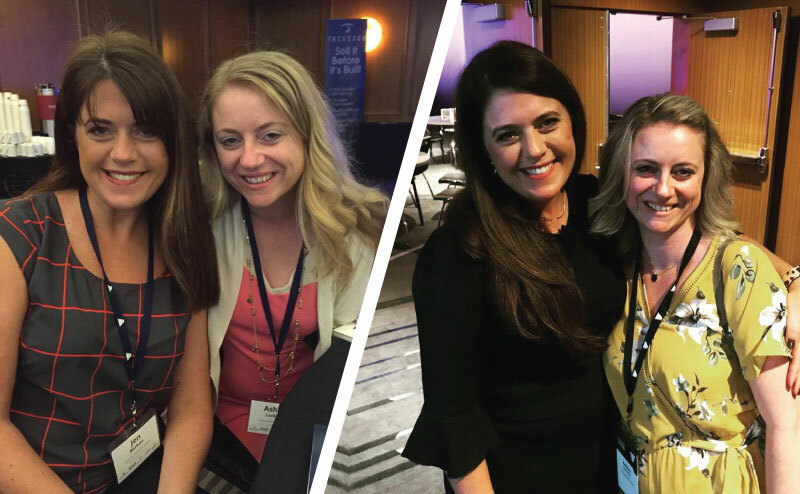 Feeling Disconnected– Several attendees came up to me during the two days of the Summit asking, “How can I get my onsite teams onboard?” I was transported right back to where I was that first year I attended our Summit as an OSC. The headshakes, and aha! moments, and copious note-taking. This experience told me that as a group, you are still feeling this way. You’re disconnected and challenged with defending your role and bridging the gap that still exists with your onsite teams and sometimes management. Here’s what I want you to understand: It’s not all on them to change and embrace online sales. It’s on us too. Here’s how you can bridge the gap. Be an influencer and channel your inner cheerleader. Celebrate victories and talk confidently about your role. Insert yourself in their world and visit the communities. Solicit sales advice and share what you’re doing to help get them more appointments. Be a teacher. Show the process and report numbers weekly. If geography is an issue and it’s hard to be in front of your salespeople on a regular basis – Use a webcam and send a video. Don’t get stuck. Out of sight- out of mind. Burnout or Rust-out– It was apparent that there were some tired online salespeople in the room. Some of the mutterings I overheard were – “I’m hanging on by a thread” and “I’m on the never-ending hamster wheel that doesn’t go anywhere.” This is a tough job, and we have to be very aware of the burnout and the rust out. Establish a backup plan. Figure out where you can take real breaks and disconnect from your phone and email. Plan your day professionally and personally. Write down one thing you will do for yourself, for another, and for your business (yes- treat this as your business). Change your view, and you’ll change your perspective. Get out from behind your desk. Stand up and walk around while making calls. Eat lunch outside and not at your desk. Discover your passion – Is it writing, marketing, videos, dogs? Think of ways to incorporate your passion into your role as the online sales specialist. The very first Summit, I attended as an Online Sales Specialist. I was finishing up my 2nd year in the role and at the time was feeling very overwhelmed. Changing the culture of my company, getting sales management and onsite teams onboard, figuring out how to get everything done in a day’s time, it often felt like I was on an island all alone. When I walked into that very first Summit, it felt like I was part of a work family. These were my people! I thought to myself, “Finally, someone that gets it.” This year it felt the same. It didn’t matter that now I was the presenter, not the attendee. We are all in this crazy, wonderful industry together. Growing, supporting, and progressing one appointment and sale at a time.